Ready to use high strength adhesive with filler. Moisture resistant and breathable. Roll straight from the tub onto the wall. Each 10kg tub is sufficient for a minimum of 2 rolls. Also suitable for use with Graphite + Insulating Lining Paper 19476 . 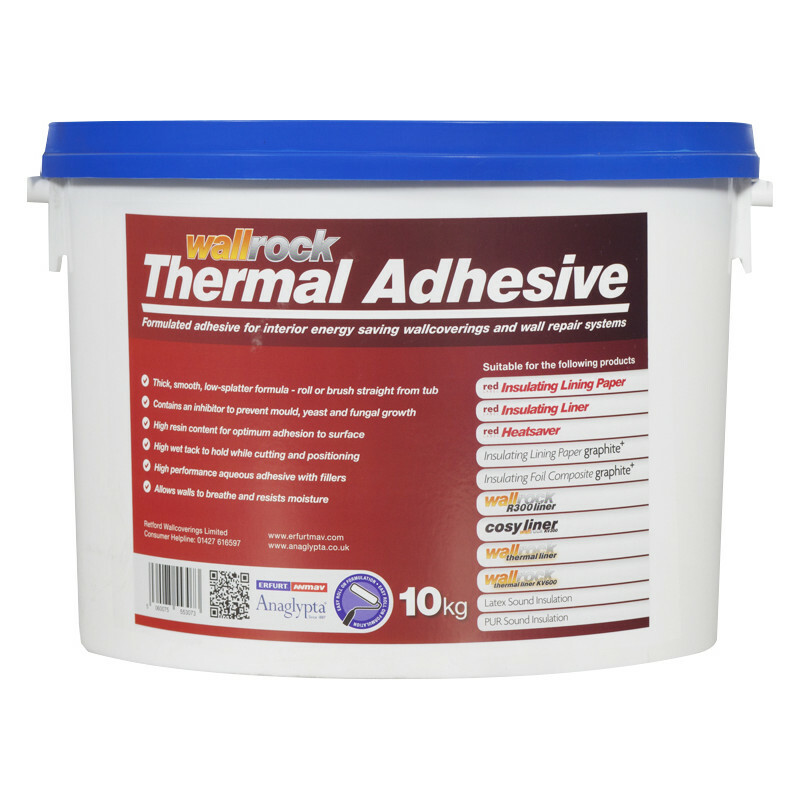 Wallrock Thermal Liner Adhesive 10kg is rated 4.5 out of 5 by 46. Rated 5 out of 5 by Tony Amb from Excellent adhesive I bought this as it was recommended to use with wall rock wall insulating paper. Very good product. Rated 5 out of 5 by abb54 from Highly recommend this adhesive This is really THE adhesive to use for such a polystyrene based liner. Easy to brush on the wall and excellent 'grab'. Rated 4 out of 5 by bobdee from Hard work Bring your muscles with you because it takes some rolling. As the info states a 10kg tub is enough for 2 rolls, well 2 rolls is what I put up (2x10m) and I have over half a tub left. The info also states the adhesive can be used to fill gaps, not in my experience it shrinks and leaves voids so I had to go over it again with a flexible filler which is an alternative in the info. Rated 5 out of 5 by Lizzy from Easy This is my second batch, it works very well. Don’t scrimp, on coverage. Rated 5 out of 5 by Pepe from Everybody`s happy! Bought this product for decorator to fix thermal lining to walls. He was over the moon with this product and said he will use it again on similar projects EXCELLENT!